For many brands, content marketing is a new art and science yet to be fully explored. The possibilities are endless, but nothing will be accomplished without the right framework in place, or the right customer insight in hand. 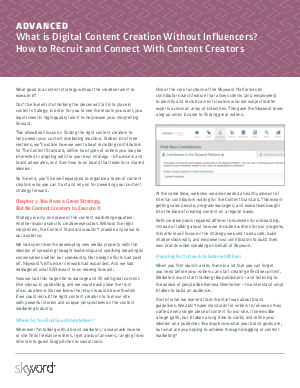 This eBook will explore the steps you must take to construct a foundation for content success at your enterprise. Broken up into three sections, you’ll gain access to first-hand insight from Skyword’s internal team on how it built its own content strategy from the ground up: Starting with creating a site for content to live, identifying areas to cover in original content writing, and how to optimize media for the new era of search. By the end, you’ll have the knowledge you need to jumpstart content strategy and become the champion of change within your organization.